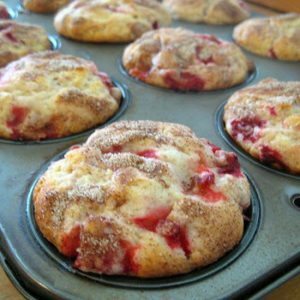 This muffins are truly tender and delicious! The down side is you really have to make these the day you bake them. Because fresh picked strawberries have a lot of moisture in them and the muffins are so moist, they do not keep well. Another type of berry can also be substituted for strawberries in this recipe. Bake at 400º for 20-25 minutes. Makes one dozen muffins.